Tata Motors is one of the most reputed automakers in the country and its Indica line-up has been among the best-selling passenger cars in the country, thanks to their fuel-efficiency and the vital value-for-money factor which is so important in the Indian market. The new Tata Indica Vista D90 is powered by a refined 1.3-liter 4-cylinder engine with 1248 cc displacement which generates power of almost 90 PS and torque of nearly 200 Nm. The Vista D90 also comes with a common rail fuel supply system that ensures high fuel efficiency and better mileage. The SDE (small diesel engine) is capable of generating a peak power level of 88.2bhp @ 4000rpm. It also generates a maximum torque output of 190Nm between 1750-3000rpm. The Vista D90 also features Variable Geometry Turbocharger (VGT) technology which is also present in the Manza, the Ertiga and the SX4. This technology automatically adjusts the engine power to varying speeds in order to provide improved power and performance even during low speeds. Admittedly, the turbo-diesel engine does feel a lot better compared to the FGT-based engine of the previous edition. However, it still doesn’t make the D90 a racehorse. The diesel-based drive train is Bharat Stage –IV compliant so it’s pretty eco-friendly. Unfortunately, the Tata Indica Vista D90 does not come equipped with an automatic gearbox so that’s a downer if you hate shifting gears. However, the 5-speed manual transmission has been improved greatly so that shifting gears is now a smoother experience. With the new and powerful toys under the hood, the Vista D90 does a good job on the road. As soon as you take the car out, you’ll experience not only improved stability even in low speeds at high gear but also smoother handling of high-speed highway drives. While you won’t find a lot of improvement in the initial pick-up, once you get her in the second gear at around 3000rpm, you get a taste of the real power of the engine. In fact, the “turbo” part of the engine starts at around 2500rpm which is when you finally experience the great improvements that the company has made in the performance department. The suspension has been stiffened up a bit so that there is less body roll while rounding the turn at high speeds. Also, the better suspension also helps to bring the car to a complete halt even from high speeds without the passengers being thrown to the front. Unfortunately, the stiffer suspension compromises drive comfort to an extent since it is not as easygoing as before, so you do feel the occasional unpleasant bump. The braking system is already pretty efficient and the additional ABS gives the brakes more teeth. 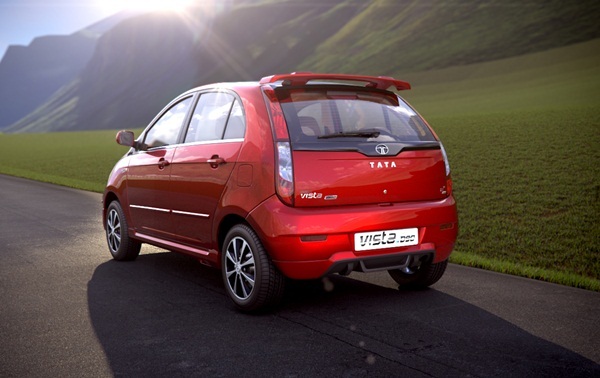 Tata Motors claims that the Indica Vista D90 gives a fuel efficiency of 21.1kpl (ARAI tested) which is pretty decent even today. It looks that the company has pulled all the stops to give the hatchback a more premium feel as far as interiors are concerned. The dual-tone beige design and the expensive-feel of the plastic on the steering wheel and the handbrake make the car look really high-end and expensive. For the very first time, the dashboard has been aligned with the driver which really makes the driver’s experience a whole lot more comfortable. The instrument cluster is a total replica of the one in the new Manza and features a 6.7-inch TFT touchscreen multimedia system along with voice-assisted GPS. Other interior features include lumber support in the front seats, 6-way height adjustable seats and power windows all around. In the high-end ZX+ variant, the centre console comes with a cool touchscreen infotainment system which also offers built-in sat-nav facility and Bluetooth connectivity. 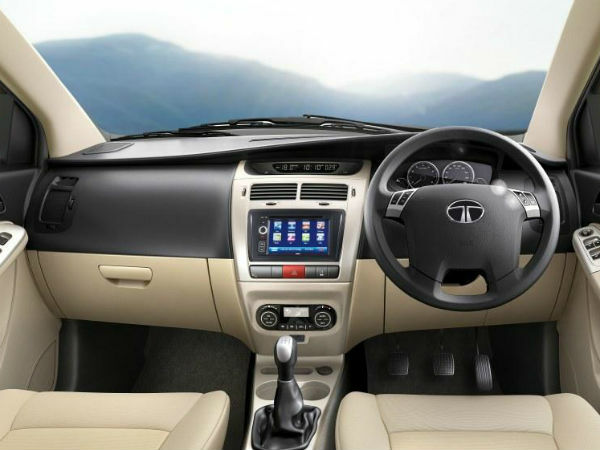 The Indica Vista D90 also comes with a trip computer that features a display screen and a completely automatic climate control system. The display gives plenty of useful information like mileage, outside temperature, range to stop for fuel and overall fuel efficiency. However, the low-end VX variant misses out on automatic climate control system (just manual AC) and sat-nav and only gets a 2-din music system. So if you’re the type who goes gaga over cool technology features, go for a high-end model like the ZX+. There are no major overhauls as far as the exterior is concerned. The D90 edition will have only a black infinity contrast roof and the ‘90’ badge to distinguish itself from other Indica Vista models. The top-level ZX+ variant will also bear the ‘ZX+’ badge at the rear. The Vista D90 also includes sporty front and rear bumpers, aerodynamic spoiler, an elegant chrome finish, triple barrel headlamps and even 2-tone alloy wheels. As mentioned earlier, the black infinity contrast roof is one of the most defining exterior features of the Vista D90. The Indica D90 is available in 5 different shades- Cavern Grey, Spice Red, Ultra Violet, Jet Silver and good ol’ Porcelain White. The Indica Vista D90 comes equipped with several features such as front airbags, ABS (Anti-lock breaking system) and Electronic Break-force Distribution (EBD) which would accord a lot more safety upon the driver, the passengers and the pedestrians on the road. 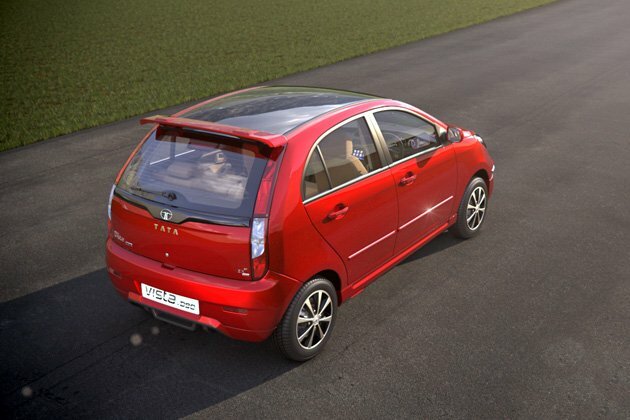 The Tata Indica Vista D90 is a fairly decent improvement over the previous models of the Indica Vista. While it has borrowed several features from the Indica Manza (for instance, the instrument cluster), it remains a class apart as a premium yet affordable hatchback. The Vista D90’s 1.3-liter turbo engine definitely brings in the horsepower albeit a little late. Moreover, the engine’s noise is hardly audible within the cabin, thanks to the powerful insulators fitted within, giving you a pleasant and noise-free journey. Another great performance factor is the great drivability that the D90 offers even while going at low speeds on high gears. This really comes in helpful for commuters who get stuck in snail-like city traffic. The interiors are also really good for a hatchback in this range. 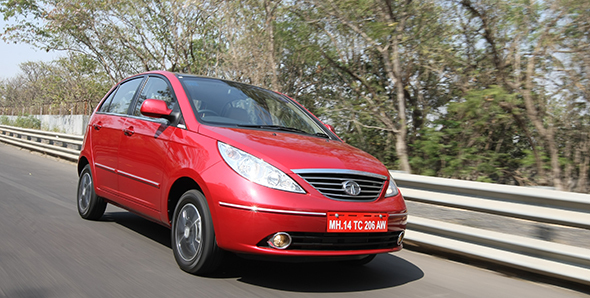 It offers the roomiest interiors in its segment and gives some sedans a run for their money. You get adequate legspace and combining this with the lumbar support and height-adjustable seats, you get the ultimate passenger experience. The top-end ZX+ variant also offers a lot of great features like automatic climate control and sat-nav which are absent in the lower variants. Thus it is safe to conclude that the Vista D90 offers certain new features and improvements but nothing ground-breaking. 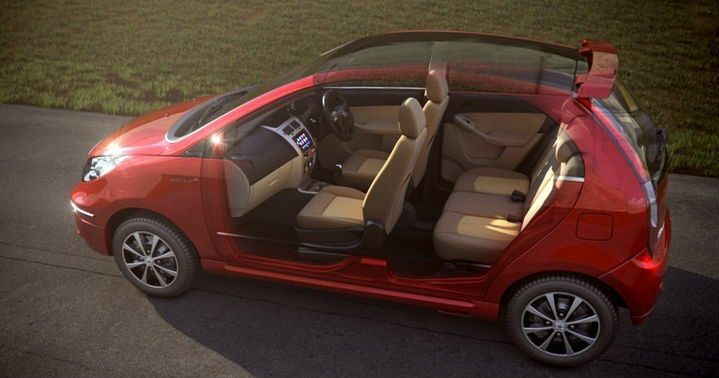 The Indica Vista D90 competes with other hatchbacks in the market such as the Chevrolet Beat, the Hyundai i20 and the Fiat Punto. The Vista D90 comes with a price-tag of around Rs. 6 lakh (Ex-showroom Delhi).